Britain’s Tory-led coalition government has presided over the sharpest decline in living standards the nation has seen since modern records began, new Trades Union Congress (TUC) research suggests. In a report published on Tuesday, the TUC said the government’s time in power has been characterized by a severe drop in Britons’ real disposable income. As part of its research, the TUC scrutinized statistics from the Office of National Statistics (ONS). It also relied heavily upon an economic indicator known as RHDI – Real Household Disposable Income – ascertained by analyzing income levels, current levels of inflation, benefits and taxes. The TUC’s report found that average living standards in Britain have fallen 0.6 percent since 2009/10. It also revealed that living standards in Britain were higher between 2008 and 2012, when the most crippling recession Britain has seen in the post-war era was in full effect. The government’s means of measuring Britons’ standard of living differs from that employed by the TUC which calculates RDHI on a per head basis. Nevertheless, Britons’ quality of life has been a key issue in the general election campaign. In his March 2015 budget, Chancellor George Osborne claimed UK citizens’ standard of living would be higher when the Conservatives’ term in parliament comes to a close, than it was when the party entered government. However, the Conservatives have failed to honor this promise, and are directly to blame for Britain’s standard of living crisis, according to the TUC’s research. 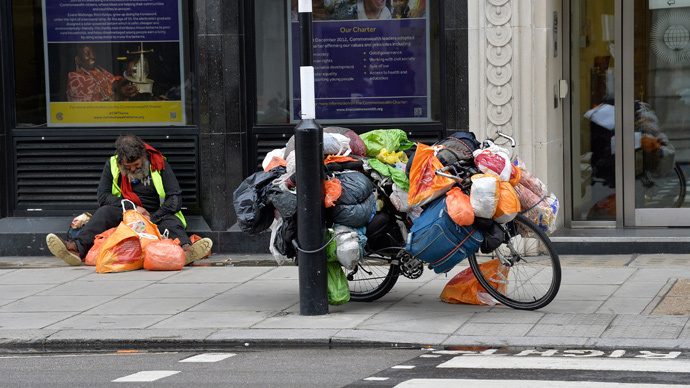 The TUC’s report argued the contraction in real disposable income Britain has experienced in recent years was caused by a number of important factors. One of the leading causes for this crisis is the failure of salary increases to keep up with inflation until recently, according to TUC’s study. It also notes that tax increases have been neutralized by tax cuts, and state benefits have been slashed. The report concluded the government’s austerity policies have had a heavier impact on Britons’ living standards than the economic and financial crises of 2007-09. It argued that the coalition’s policy prescription of “deep and rapid cuts” has jeopardized Britain’s economic recovery. Following the report’s release, TUC general secretary Frances O’Grady said workers are “paying a heavy price” for the government’s poor economic policy decisions in recent years. Reflecting on the slump in living standards, O’Grady claimed austerity had failed. “There’s still a major deficit, jobs are less secure and workers’ living standards have fallen,” she said. O’Grady stressed Britain needs a government that grasps the importance of pay growth and secure jobs for a vibrant robust economy. "If workers don’t have decent wages in their pockets to spend, businesses will struggle to invest and grow,” she said. O’Grady said Tory plans for “extreme austerity” post May 7 risk jeopardizing Britain’s recovery. Earlier this month, four hundred psychotherapists, counselors and mental health practitioners across the UK warned severe austerity measures are having a detrimental effect on Britons’ psychological and emotional wellbeing. In an open letter, published by the Guardian, the mental health experts said Britain has seen a “radical shift” in the psychological state of ordinary people since the coalition came to power. The letter’s signatories, who stemmed from all corners of Britain, said the government’s welfare reforms have caused serious emotional and mental trauma to Britons – forcing families to relocate against their will and burdening disabled, ill and unemployed benefit claimants with an intimidating benefits regime.